ALGRA S.p.A. is a well-structured Company, with share capital of € 2,200,000.00 which achieves in the year a turnover of over 21 million Euros, using a staff of 100 people. The Company’s founder, Alberto Pesenti, is the President and C.E.O. with a used lathe, in the garage of his home in Brembilla, a small village situated 20 km from Bergamo. It is the beginning of a story, common to many small artisan companies in the valley. At the beginning of the year S.n.c. AL.GRA was formed, acronym of the names of Pesenti brothers. A family company with two employees. Alberto Pesenti wants to give immediately the industrial mark: to work for the growth in quality, in the world of mechanical machining for third parties. With this concept the Company grows, beginning to outline an own imprint made of ability, determination to achieve the goals, challenges and corporate culture. The first plant was born, also in Brembilla (now Val Brembilla). A functional structure of approx. 500 squre meters, then expanded to an area of approx. 2000 square meters. A little over ten years after its foundation, the small factory transforms its corporate form into a Stock Corporation, ALGRA S.p.A.
Business expansion in several areas at international level, the need to respond quickly to the challenges and the market competition, leading the Company to structure differentiating the production of products for third parties to ALGRA brand production of spare parts and toolholders at catalog. The new plant in Almenno San Salvatore (few kilometers from the north of Bergamo), a cutting-edge facility, well organized and situated in a pleasant area where today there are the headquarters of production and offices, has marked an important step for the Company. 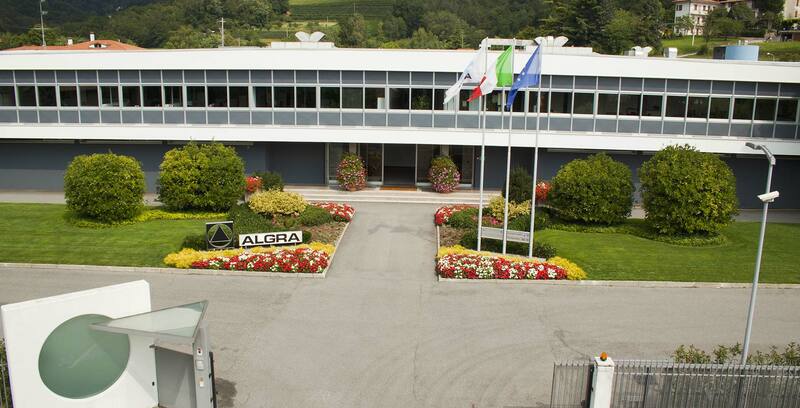 The activity is carried out in the factory in Almenno San Salvatore, which has an expanded and renewed area of approx. 13,000 square meters with a staff of over 100 people. Its own plants in Val Brembilla is a valuable support to the production logistic. Continuous innovation distinguishes the evolution and continuity of this history. Many small goals which built an important and advanced Company in its trade, where all the staff is involved through their ability, potentiality, participation in order to achieve shared goals and values: innovation, continuous quality improvement, safety and sustainability.